Surface tension is the energy a liquid contains that prevents its surface to be deformed by an object with a higher surface tension/energy. The surface energy of water has as a side effect that it can form beads on surfaces with a very low surface energy or high repulsive force. All molecules have a certain attraction towards each other. Molecules from water have a higher attraction towards each other then to the molecules of air. This means that water and air don’t easily mix. Because the attraction between the water molecules is higher then the attraction with the air molecules, the water stays together. Without adding any form of energy, the air won’t be able to cut through the water, or mix with it. If an object with a very low surface energy comes into contact with the water, it will push the molecules away, rather then mixing with them. Some insects are able to “walk” on water, which is thanks to the surface tension of the water. Their feet push the water away, but the viscosity of the water creates enough resistance to carry the weight of the insect. Surfactants are an easy way to change surface tension. For example, if you very carefully put a sewing-needle on top of water, it will float on top of the water. If a surfactant is added to the water, the surface tension will drop, and the needle will sink into the water. This surface tension also prevent water from being very good at mixing/combining with other substances, which also means that is very bad at cleaning (water would have to combine/mix with contaminants and be able to carry them away). Adding a surfactant will make it much easier for the water to combine with the contaminant and carry it away. A lowered surface tension will also allow the formation of foam. Surface tension is also affected by temperature, the lower the temperature of water, the higher the surface tension. This basically means that colder water will form nicer round beads. Very hot water will create flatter, less round beads. Rinsing your car with warm water will give you a false idea of beading. It might in fact be better then it looks. However, warmer water has better cleaning properties. 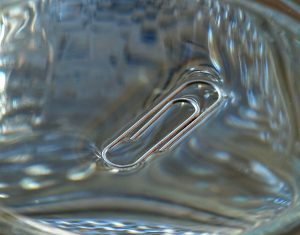 Surface tension only applies to liquids, surface energy can also be applied to solids, which makes it a more universal term. The two terms are equivalent. Thanks to surface tension, water can create nice round beads, which is a loved side-effect by detailers. If the roll-off angle is right, it will also aid greatly in the sheeting properties of a product. If the surface tension of water was much lower, the beads would be more flat and the sheeting would be a lot less. This can be seen when you spread a water/shampoo mixture over a surface. It is clear to see that water/shampoo doesn’t create the nice round beads that just water does. The same happens with snowfoam, if the surface energy is low enough, the snowfoam would suffer from the low roll-off angle and the snowfoam will not clinge very well. A dirty unprotected car will keep its snowfoam blanker, while a clean and well protected car will cause the snowfoam to break open and slide off.